Last week, my dear Nina and I had a LONG overdue dinner date. Sometimes, just being in the company of a good friend is all you need to lift your spirits and this is what Nina does for me! Nina and I decided to go to a Shabu Shabu restaurant. For those of you who don’t know, Shabu Shabu is where you are served thinly sliced raw meat and veggies, which you cook yourself in a wok of boiling water. When the meat is held with chopsticks and slushed around the wok, the Japanese think it makes a sound like “shabu, shabu” — hence the name. 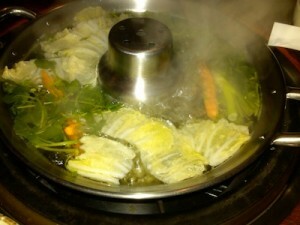 As you are cooking the meat and veggies in the boiling water, you are also making a flavorful broth. 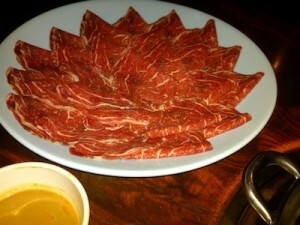 This is a great alternative to Korean BBQ. 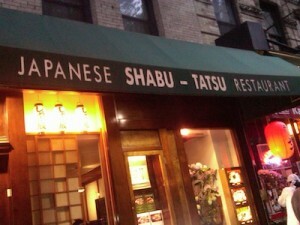 Shabu Tatsu in the East Village is one of the best restaurants around, for quality and service. Our kind waiter sat us down and unveiled a square burner embedded in our table. He placed a wok filled with water and turned on the burner. Within a couple of minutes our meat and veggies were ready to be dunked! Nina and I ordered the beef tenderloin for two (the cheaper version on the menu, which is also less fatty) which was thinly sliced and given to us on a large platter. We were also given a large plate piled high with assorted veggies such as cabbage, carrots, and scallions. We also had tofu and noodles to cook in the broth. 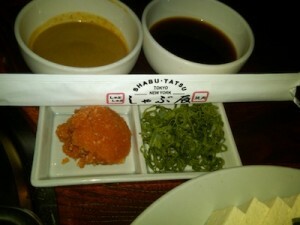 To accompany our meat we had two dipping sauces: one soy sauce based and one peanut/sesame based. As soon as all our food was out and the water was boiling, Nina and I started dunking our meat and veggies. To add flavor to the broth, we began with the veggies first. As our veggies were being cooked we added small amounts of meat, which cooked in less than a minute. As the meat and veggies cooked, we pulled them out and enjoyed them with our sauce, over a bowl of fragrant rice. We also placed the noodles and tofu in, towards the middle of the cooking process. We casually continued this process — dunk, cook, eat, repeat — and once all the meat and veggies were done, we had an extremely flavorful broth to enjoy! I love Shabu Shabu because truly, nothing goes to waste! I also loved this because it is such an interactive meal. As you’re having great conversation, everyone is enjoying cooking their meal! 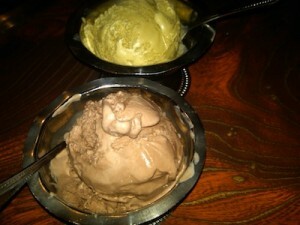 Once our Shabu Shabu meal was done, it was time to move on to dessert. As we completed our meal, Nina and I went to sit outside — the East Village location has this lovely bench where to linger a bit — and we noticed a tall, burly Italian-looking man in a light suit. In a characteristic accent that made him sound like he had just arrived from Brooklyn, he shared his own wisdom: “Shabu Shabu, you can’t go wrong — it’s the Asian fondue!” Yes, my friends, I leave you with his wise words and a strong suggestion for you to try Shabu Tatsu on your own. This is truly an experience you will never forget! This entry was posted on Wednesday, May 18th, 2011 at 12:38 pm and is filed under Adventures, Food, Tasting the World in NYC.